Trevor and I were on our way home from Tahoe this past weekend for our 6 year Anniversary!!! We had a blast: hiking, Squaw Village Oktoberfest, short run home in lightning, yummy dinner, spa, wine, and a great time watching football and baseball on Sunday!! On the way home Trevor mentioned he was craving Tomato Soup. It was raining in Tahoe and I think the weather put us both in the mood for comfort food. 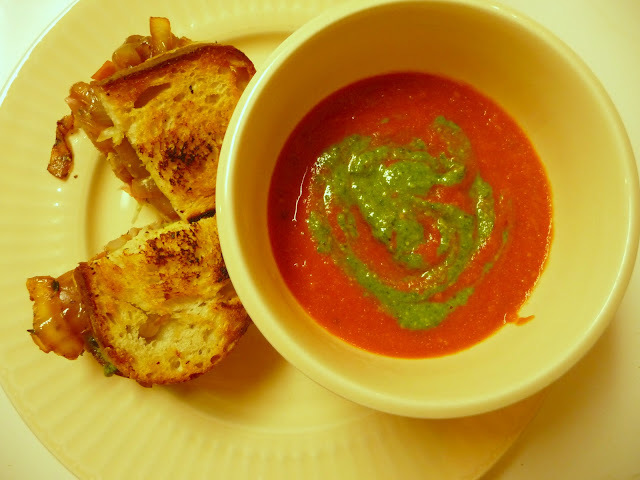 After some thought and poking around on Epicurious (only one of my favorite websites) I found some good ideas for Tomato Soup and Grilled Cheese Sandwiches. 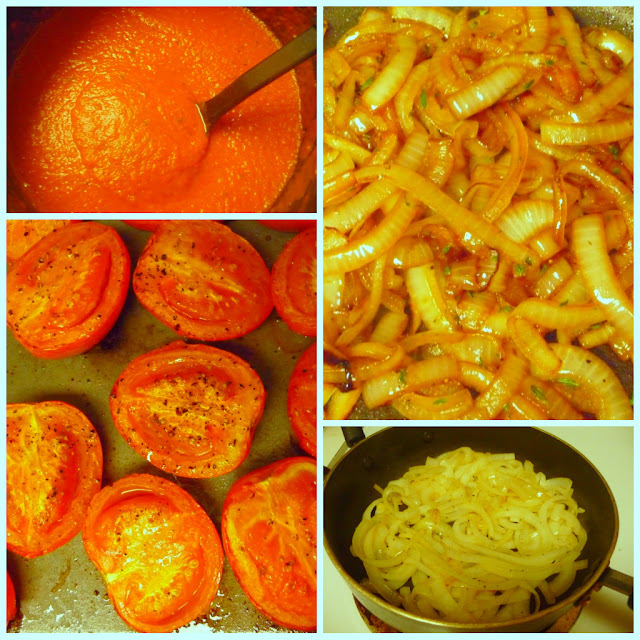 I took a few ideas from some of the recipes and adapted them to fit my taste buds. I do not normally order/make Grilled Cheese Sandwiches, however I must say that both Trevor and I gobbled these up. They were amazing!!! The last photograph is the second sandwich I made for Trevor. 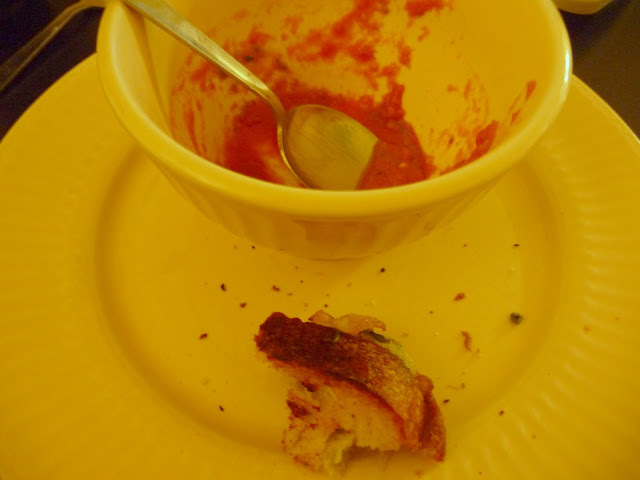 Also, I used the Basil/Walnut Pesto for both the soup and the sandwich, which added some zing (or BAM as Emeril would say). I have always made my Pestos with Walnuts because my family owns a Walnut Farm and they are amazing in Pesto's. However, one of my best friends and amazing roommate, Allison, is Italian and her Pesto's are always to die for! Well, actually almost everything she makes is to die for:) She makes her Pesto the traditional Italian way: without any nuts! Most American recipes call for Pine Nuts, which is the main reason I grew up not very found of Pesto's. I can't stand Pine Nuts! I know blasphemy! Try your own variation on Pesto (no nuts, any nuts, different herbs or tasty greens like arugula, or no herbs at all and use roasted bell peppers, etc). There are so many ways to make and use Pesto. Just remember to use your Pesto within a few days or freeze for a later use! 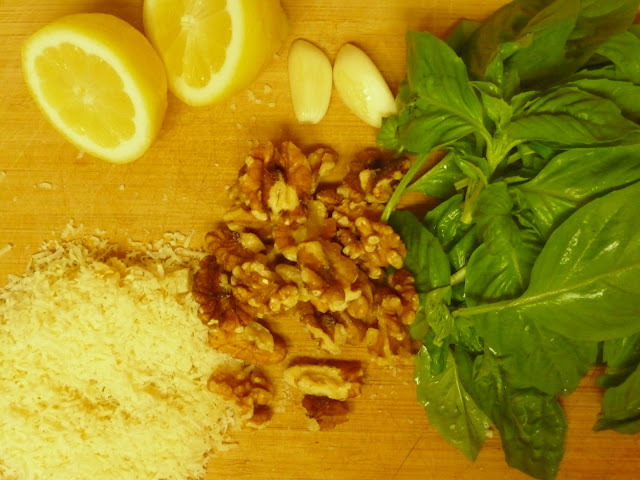 Place all ingredients in the blender except for the Olive Oil. Puree until smooth slowly adding the olive oil. Add additional olive oil if needed. Add salt and pepper to taste. Preheat oven to 450 degrees Fahrenheit. Place cut tomatoes on roasting pan with 2 tbsp of olive oil and salt/pepper. Roast for approximately 30 minutes until the skin is splitting. Remove from oven and let cool. Meanwhile saute shallots, garlic, salt, pepper, thyme and about 1/4 - 1/2 tsp of crushed red pepper. Saute until shallots are soft. Puree the crushed tomatoes with the shallot/garlic mixture until smooth. Pour into a medium size pot over medium heat. Remove skin from cool tomatoes. Place in blender and puree until smooth. Add to pot. Add additional salt/pepper/crushed red pepper to taste. Once hot add cream. Serve with pesto on top and the grilled cheese sandwiches. Onions: Saute onions with 1 - 2 tbsp of olive oil with salt and pepper until almost translucent and beginning to brown. Add vinegar, sugar, and thyme. Almost immediately they will pick up a deeper brown color. This is good! Remove from heat once soft. 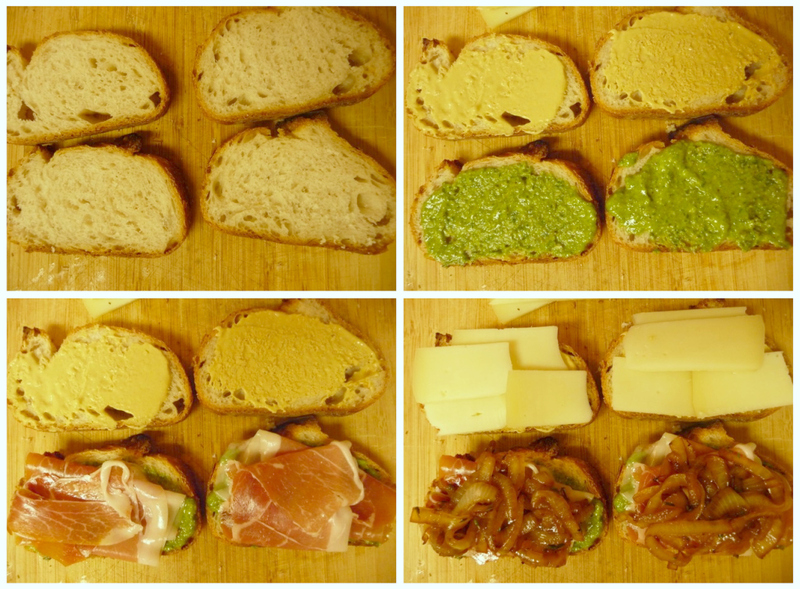 Sandwiches: Preheat oven to 450 degrees Fahrenheit (same as tomatoes conveniently :) )Spread one slice of the bread with pesto and the other with dijon mustard. Top with prosciutto, onions, and then cheese. Top with other slice of bread. Heat 2 tbsp olive oil in pan over medium high heat and place sandwich in pan. Once bread is toasted flip sandwich. Place pan in oven until cheese is melty and other side of bread is toasted from the left over pan heat. Serve immediately. That sandwich sounds ridiculously good! I wish I had all of the ingredients to make it for lunch!! !